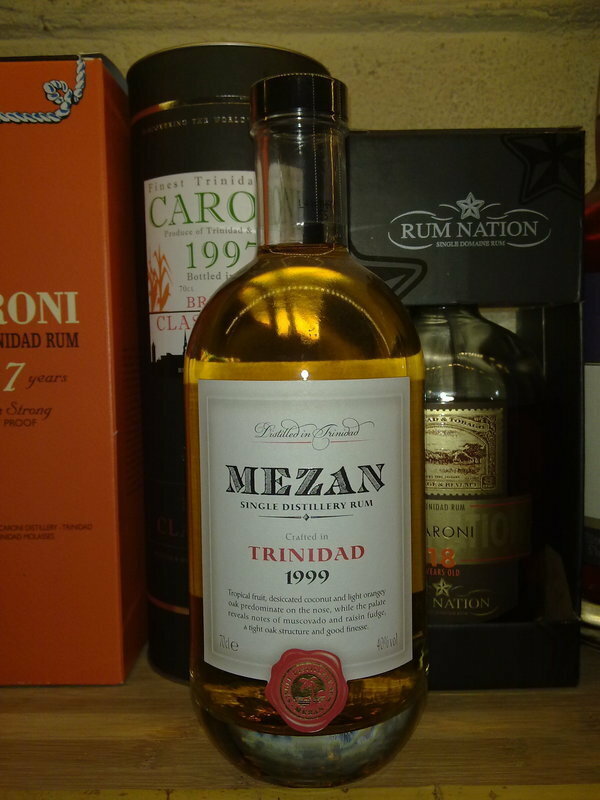 Have you found an online vendor selling Mezan Trinidad 1999? Typical Caroni aromas at low Abv : if a "true" Caroni at 50-55% Abv is too strong for you then you could try this to discover this particuliar style of rum (very rich and complex aromas with some tar/liqorice). That beeing said I enjoyed the 1996 so much... The 1999 is still a very good rum but maybe too much diluted? A essayer pour découvrir le style Caroni si les bouteilles à 50° et plus vous rebutent. Arômes typique des rhums Caroni (très complexes, côté goudron/réglisse assez étonnant au début) mais un peu trop dilué à mon goût, j'ai préféré le 1996 du même embouteilleur. Ça reste un très bon rhum. An exellent rum. Not too common and an intersting background. The bottle is heavy and looks cool. The colour is light straw brown,no sugar and artificial aromas added.It's a very pure rum.It looks like a whisky but it smells fantastic. Rich fruit,ripe banana,honey. The first sip reminds on a well aged scotch single malt but a little sweetness balances the oak. A warming afterburn but no bite. I am very satisfied with this rum,it shows the amazing variety of different countries and production methods. In der Nase sind die Caroni Düfte da, aber wie durch einen Filter, harziges und verbranntes Holz, angekohltes Karamell, mit Kakao geröstete Früchte. Im Gaumen halt sehr mild da nur 40% und dennoch die breit Palette an Caroni Aromen, jedoch wie du ein Kondom über der Zunge hättest. Verbranntes Holz mit Karamell beschmiert und mit Lakritze übergossen, karamellisierte tropische Früchte in Baumharz gegossen drücken durch die zarte Gummihaut. Im Abgang die typischen Aromen von vergessenen Marshmallows am Lagerfeuer und ausgepusteter Petrollampe die auch am Morgen danach auf der Zunge kleben. Ein weichgespülter Caroni der aber die typischen Aromen in Sich trägt. Für Entdecker des Caroni styles sich eine gute Option. Rich straw yellow in the glass. Caroni aromas are present in the nose, but like through a filter, resinous and burnt wood, charred caramel, fruits roasted with cocoa. On the palate it is very mild, only 40% and still the wide range of caroni aromas, but like you would have a condom over your tongue. Burnt wood smeared with caramel and covered with liquorice, caramelized tropical fruits poured into tree resin press through the delicate rubber skin. In the aftertaste, the typical aromas of forgotten marshmallows around the campfire and puffed out petroleum lamps that stick to the tongue the following morning. A softly rinsed Caroni which carries however the typical flavours in itself. A good option for discoverers of the Caroni style. Enjoyed a glass of Mezan Trinidad 1999 and the bottle looks pretty nondescript, label is basic, color is very light for an aged rum. Fruits are immediately noticeable to the nose. Taste test is a watered down fruit bowl, good but far from great. Alc. % is too low in my opinion for a caroni. This one is still ok but lacking depth. Shrnutí:	Ochutnávali jsme na společné rumové párty s kamarádem, tohle byla jedna z jeho nově otevřených lahví. I absolutely agree with reviewer laurent...although this is a delicious rum from Trinidad's Caroni sugar factory, it's been watered down far too much. As a result, what could have been a spectacular rum is merely a good one. Imagine ordering a dram of your favorite whiskey and having it served in a very large glass of water, and you get the picture. I came to Mezan rums via their Panamanian, which I am a great fan of. But this....wow!! The nose is superb. Dry, warm, spicy fruit. Hints of tropical fruit, orange and gentle oak notes. The palate has a slight smokiness to it, that blends with the fruit and oak to leave a very smooth easy finish with a gentle input of alcohol. The first bottle of Mezan I ever had was from Panama and was bottled at 42%. While I generally prefer my rums at 40%, I can't help but think that this might be better at 42%. Having said that, I tried a few drops of water in it (and it really was a few drops as I didn't want to dilute any further), and this released stirred oils and accentuated the smokey orange peel flavours. Pale straw brown color. Aroma is truly inviting, spicy, vanilla, banana, clove, hints of honey and orange. Nice spicy warming, light sweet, oak and vanilla mouthfeel. Awesomely ballanced, extraordinary and superb rum!